flowers for flower lovers. : Loosestrief Purple flowers. Purple loosestrife is known for its amazing seed production, with up to three million seeds per plant! This aquatic, perennial weed can swiftly suffocate wetlands, displacing valuable native habitat for both plants and animals. 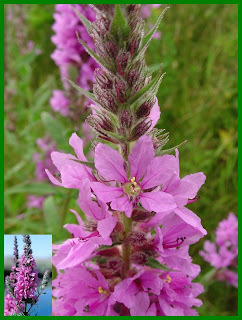 Purple loosestrife was introduced to North America from Eurasia in the early 1800's, most likely as seeds in ship ballasts (although possibly attached to wool or brought as a medicinal herb). It reached British Columbia in 1915. Loosestrife is thought to be responsible for the modification of more wetland habitat than is the current development pressure caused by humans. Despite these detrimental impacts, is often admired for its showy red-purple flowers.